Where she stopped the sign read: "Madame Sofronie. Hair Goods of All Kinds." One flight up Della ran, and collected herself, panting. Madame Sofronie was large, chilly, and too white. 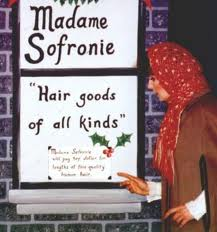 She hardly looked the "Sofronie." "Twenty dollars," said Madame, lifting the mass with a practiced hand. The next two hours tripped by on rosy wings. Della was ransacking the stores for Jim's present. She found it at last. It surely had been made for Jim and no one else. There was no other like it in any of the stores, and she had turned all of them inside out. It was a platinum fob chain, simple and chaste in design, properly proclaiming its value by substance alone. As soon as she saw it she knew that it must be Jim's. It was like him. Quietness and value, the description applied to both. Twenty-one dollars they took from her for it, and she hurried home with the eighty-seven cents. With that chain on his watch Jim might be properly anxious about the time in any company. Grand as the watch was, he sometimes looked at it on the sly on account of the old leather strap that he used in place of a chain. When Della reached home her intoxication gave way a little to prudence and reason. She got out her curling irons and lighted the gas and went to work repairing the ravages made by generosity added to love. "If Jim doesn't kill me," she said to herself, "before he takes a second look at me, he'll say I look like a Coney Island chorus girl. But what could I do? Oh! what could I do with a dollar and eighty-seven cents?" At seven o'clock the coffee was made and the frying pan was sitting on the back of the stove. It was hot and ready to cook the pork chops that Della had bought the night before. Jim was never late. Della doubled the fob chain in her hand and sat on the corner of the table near the door that he always entered. She waited impatiently for him to come home. Then Della heard his step on the stairs way down on the first flight. Quickly, she stood up and fixed her hair one last time. Then she turned white for just a moment. Della had a habit of saying little silent prayers about the simplest everyday things, and now she whispered, "Please God, make him think I am still pretty. Make him love me just the same." The door opened and Jim stepped in and closed it. He looked thin and very serious. Poor fellow, he was only twenty-two and already burdened with a family! 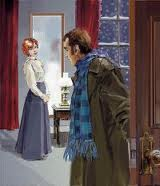 He needed a new overcoat and he was without gloves. "Hello, dear," Jim said. Then he looked up at Della. Jim stopped inside the door, as immovable as a setter at the scent of quail. His eyes were fixed upon Della as she stood in front of the pier-glass. Della tried to smile, until she looked into his eyes. There was an expression in them that she could not read, and it terrified her. It was not anger, nor surprise, nor disapproval, nor horror, nor any of the sentiments that she had been prepared for. He simply stared at her fixedly with that peculiar expression on his face. See the next page for the conclusion of "The Gift of the Magi."